Here's a feature I've been putting off for a long time. I discovered my first card couple card shops in Japan on accident early in the year, and I've reported a tiny bit on a some of my finds, but I've never really talked about any particular shop's specifics. So it's time I do just that! And what a perfect time this is to post about card stores, as I made it a point to visit four of them on Monday. My second stop was Mint Ikebukuro. "But wait!" I hear you say, "Where was the first?" You will just have to wait for that one, as I didn't buy anything this time. So on to Mint Ikebukuro. This is really three stores in one. On the first floor, you find mostly soccer and idol cards, plus some unopened product from several sports. I took a quick look around and headed up to the second floor where the real goods are. The second floor has two shops across the hall from each other. You can't go from side to side with merchandise - you have to pay in each section separately. One of the sections is mostly card games (think World of Warcraft, but on a much bigger popularity scale). I didn't buy anything there. The other shop (the one to the left after you climb the stairs is a Japanese baseball card paradise! My scanner cropped the cards just a little too much, but you can just barely see the word "GEORGIA" in the upper-left. Georgia is Coca-Cola Japan's coffee brand, and I'm guessing this card was a premium inserted into product or available through a redemption offer in 2010. There is a regular GEORGIA release with active players so I think this might be a more limited issue. And as is customary with most recent BBM releases, there is a foil signature version, which I snatched up immediately as well! Yes, BBM made these cards - notice the logo in the upper-right? (Why can't Topps adopt something like that, with the year imbedded in the logo?) I should mention that both Georgia cards are a bit smaller than standard, similar to the 1987 Topps Minis found in 2012 Topps's release. Now this is a scary card. And I knew I had to have it. I've never heard of D-1 coffee, which might not exist anymore. But in 2006, BBM released a set similar to the Georgia set. This has a facsimile black ink autograph, as you can see. Another oddball I picked up was this Yakult Swallows vending machine card. It's probably a team issue, as it has similar manufacturing characteristics to the team issue I picked up this year (which you haven't seen yet). Here's an insert from the 2012 Lions team set. It's called The King's Roar, and it's super-foil shiny, like a late 1990s Donruss/Leaf card. There's plenty of gold foil too! This sticker card came from a Lotte product. Lotte stickers can be difficult to track down, and they aren't issued anymore. There's gold foil highlights on this one, and all those logos on the left are separate stickers. This scan came out really good, other than the bottom being cropped off. There's a black border with the team name that's gone missing. This is a clear acetate card, issued by the Swallows and is completely blank-backed. This is a premium card from the Swallows 2008 team issue, honoring Masanori Ishikawa for 1000 somethings - probably 1000 strikeouts. A bit of the bottom got cut off on this scan too, but I like how the bouquet he's holding jumps out of the card's border. I wonder what happened to his leg. And arms. And eyes. Oh wait, his eyes were always that way. Back to the Lotte stickers! This is a silver foil issue, with many more stickers - 15 total, to be exact. The gold issue was released in 2007, and this was printed in 2006. Another Yakult Swallows team issue, this time as just a base card. And another 2008 "premium" issue by the Swallows. This time, the base premium card... Oh, Swallows, you try so hard! This card really has a BBM-made feel. And it was probably made by BBM, even without logos. Hello. I'm Michael. I play baseball. Remember that foil Lions insert card I showed you above? Well, this is another foil insert. Actually, it's a parallel of the base set with a foil background. BBM has been doing that with all the team issues this year. Thankfully they don't carry a premium at the card shops right now, though they seem to be in fewer quantities. What does the base card look like, you ask? Well, here you go! There have been a few retro-style team issues this year, and I kind of like it. There's certainly a change from prior years' releases, which tend to look somewhat similar. Speaking of other team issues, the BayStars have a team set titled "Reborn," which either honors their return to good playing, or their new name (they used to be the Yokohama BayStars, and now they're the Yokohama DeNA BayStars). I'm guessing it's the rename. The BayStars are currently 20-38, 16 games out of first. Hey! Another Konami game card! You know what that means! Missing limbs! Who needs fingers or legs, anyway? Or noses or mouths? Breathing and eating is overrated. 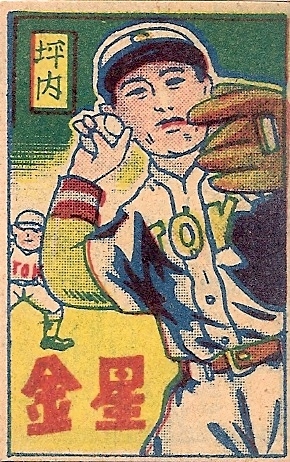 Did the NPB version give the players all their appendages? Of course not! Well, at least Ishii has one leg. Or is that just his foot? And his globs of hands sure are holding that bat high. Wait, where's the catcher and umpire?! Speaking of other players, Kenny Rogers above has nobody in the field! Is he that good, that he can pull a Satchel Paige and call his fielders in to rest? "Don't worry, boys. I can pitch another perfect game, and strike out all 27 batters!" Let's finish with a giant card. This card is twice as large as a regular card, and must have been a box-topper. It was issued in 1999 and honors Kenshin Kawakami winning the 1998 All-Star Game 1 MVP award. Japanese baseball has multiple All Star Games in different cities/stadiums - three in 1998, it seems. There will be three in 2012 - July 20, 21, and 23. That's the East Exit from the JR Ikebukuro station, and then you can basically follow the map. Or go to their website (in Japanese only). They're open daily 11AM to 8PM. Who were your childhood favorites (players)? Do you collect their cards & memorabilia? If so, what's your favorite item (of your favorite childhood player) in your collection? Canseco had problems as early as the 1989 season. I remember him being pulled over for going over 100 mph in his car, and having a weapon in his back seat. Plus, there were injuries and lackluster seasons. I eventually lost interest in him. But my love of reading and baseball brought me two other new favorite players: Tony Gwynn and Nolan Ryan. Nolan Ryan was a legend by the time I started collecting, and having the same last name as my first name certainly didn't hurt. I never cared for the Padres, but I read about Tony Gwynn's approach to hitting in a book and had instant respect for him. When I was a child, I didn't really collect players - I collected everything new. I loved pack busting. I had a Nolan Ryan memorabilia collection, because it was easy to find his stuff. But when I returned to the hobby, two of my first collections were Nolan Ryan and Tony Gwynn player collections. I wanted one of everything, but as you know, that's impossible. I ignored those player collections and actually gutted them when I started my type collection, but I kept a few choice cards for a "favorite cards" collection. And I think they're pretty cool. I love Sweet Spot autographs (as long as the signature stays intact). I picked up the Sweet Spot auto off of eBay. But the green Baseball Heroes autograph came from the only pack I opened of Heroes that year - an awesome pull indeed. Again, the autographs are the highlights of my collection, and I think I have at least three trifectas of Gwynn. I have plenty of memorabilia cards, at least a couple more autographs, and at least one each of his three rookie cards (Topps, Donruss, Fleer). And again, the autograph trumps all others. I have his prime RC in my complete '89 UD set, but this is much nicer to look at. I'm still trying to get a Frank Thomas autograph (he's become quite valuable in recent years). I don't know why I focus on autographs so much for the highlights of my collection. I enjoy all my cards for each of my favorite players, but I guess autographs and relics now just have that extra added touch. 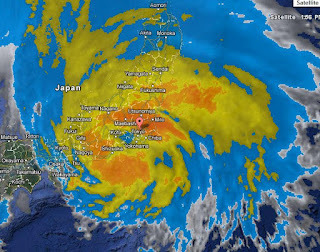 A typhoon is raging across Tokyo as I type this. See? 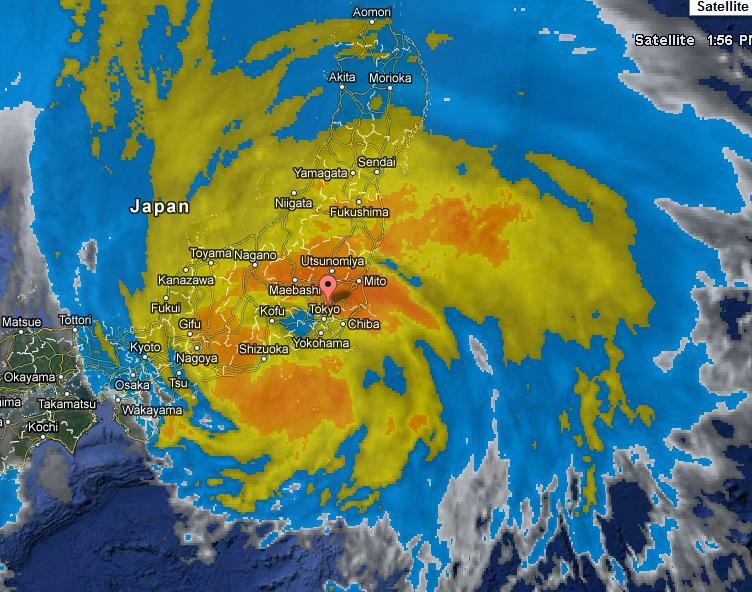 I live basically where that point is near the middle of the image... and the middle of the storm. It isn't pretty. I'm risking life and limb to bring you this post! Okay, so in all honesty, I'd just be sitting in the same place, staring at the same computer screen, if I wasn't writing this post, so I'm not doing anything different. Besides, where would I go? Don't worry, though, I should be fine. If I die, I'll let you know. What is your favorite vintage card and/or 90's insert card in your collection? Why? How did you acquire it? Most of my vintage cards were bought for my type collection, and don't really hold any sentimental significance. I don't have a Nolan Ryan RC (which would certainly top this list if I had one). I have some really cool older cards, but they don't mean much other than a check off my list. Those checks are more significant than, say, 1988 Donruss or 1996 Upper Deck, but they just aren't my favorites. The 1990s were my golden years as far as collecting was concerned. I had way too much discretionary income and it all went to unopened boxes and packs. I especially love Fleer's offerings - they always seemed to have the best overall inserts from year to year in nearly every product. I especially loved the Pro-Visions issues in Fleer, and the "gimmick" inserts found in Ultra in the mid-'90s (acetate, textures, etc). Two of my collections center on prominent insert sets of the 1990s: Baseball Heroes and Diamond Kings. I love the designs and concepts behind those offerings. I have over 100 insert and specialty sets completed or in progress from the 1990s that I could choose from. 1991 was a big year in my life. I really, truly embraced the baseball card hobby, visiting card shops frequently, and buying many more cards than before. Of course, I can say that about several years, but 1991 was the last year I lived in California before moving to Georgia. Nolan and Rickey were two of my favorite players, and these events defined my summer. Honestly, I don't remember anything else about 1991 other than Rickey Henderson, Nolan Ryan, and the Braves/Twins World Series. I made my first color copy ever, paying my hard-earned allowance money for an image of the Sports Illustrated magazine cover with Nolan Ryan on it (so I could display it and keep the original magazine in good condition). So when I pulled one of these cards from a pack in 1991, that was a big deal. Even if my world didn't revolve around these two guys, it would have been a big deal, because I think this card booked for big bucks even then. At least, a good bit more than the 50 cents it would cost on Check Out My Cards today (book price: $2.00). I'm not sure if the card that is in my collection today is the same one I pulled in 1991. I might have picked up another extra copy or two and the original pull is sitting in a duplicates box in my storage unit. But this card is certainly a treasure of mine! And while I'm talking about Upper Deck's SP insert cards... Did you know Nolan Ryan is the only player to appear three times in the SP issue (and the only one with two cards all to himself)? Robin Yount has two cards (one with George Brett), and Derek Jeter has an SP card and an R- prefixed SP-style card issued in 2010 with three other Yankees. BBA: This card is cheap... er, cool! Fuji must have designed his current contest with me in mind. I bet he was thinking, "Hey. Ryan needs some incentive to write posts again. He only posts once a month these days. I know! This year's mega-contest will have a blog bat-around component! That'll work!" Damn. He knows me better than I know myself. What's a cheap (under $5), cool card you feel every collector should add to their collection? 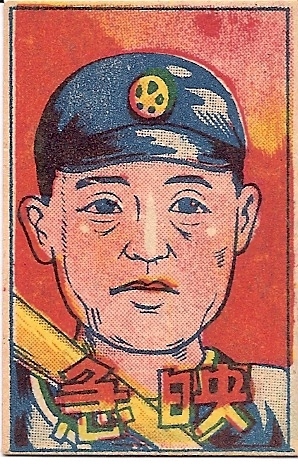 Seriously, the first time I saw a baseball menko card I fell in love. There are round menko like the one above (which, by the way, comes in nearly half a dozen different sizes). There are colorful artistic menko, like the ones above and below. And there are die-cut menko (though those can be pretty expensive). Yes, even trains. I have a couple of those. What will a menko cost you? In America, it could be kind of expensive. But the giant round baseball menko at the top ran me 200 yen (about $2.50), and the non-sport menko (in non-mint condition, as to be expected) ran me less than 40 yen (about 50 cents) each. By the way, I have some extra menkos sitting around, and after I take care of the (at least) seven people I promised Japanese cards to, I'll probably post some as trade bait! Do you ever go to flea markets in search of collectibles? If so, what are some of your favorite flea market purchases? Yes. I literally copied that direct from his website. Fast forward to 2009 or so, and I start looking around Georgia for similar setups at the local flea markets. Unfortunately, the Atlanta-area flea markets are almost exclusively professionals selling cheap imported goods, food, storage unit castoffs and thrift store rejects. I searched and searched and the best I ever found was a pile of 1990ish commons in G-VG condition for about $1 each. Yes, it was that bad. I've had much better luck at antique malls and (to a much lesser extent) thrift stores. 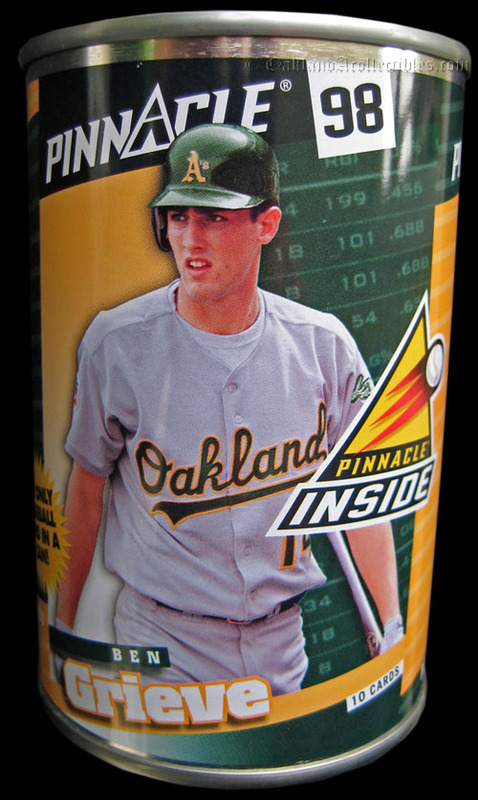 This Pinnacle Inside can (still sealed) for 50 cents. A bunch of Starting Lineups, usually for $1-2 each, or less! 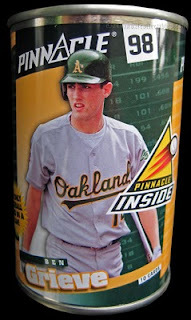 Bobbleheads for $5 each (and another Pinnacle Inside can for $1) - the RC Cola can came from another place. And this bobblehead - mint in ugly box for $5. I've certainly found a good number of collectibles at the few flea markets I've attended, though my luck with actual cards has been limited! I'll hopefully follow this up with an awesome post after this or next weekend, as I'll be attending my first Tokyo-area flea markets. A contest you might not know about.